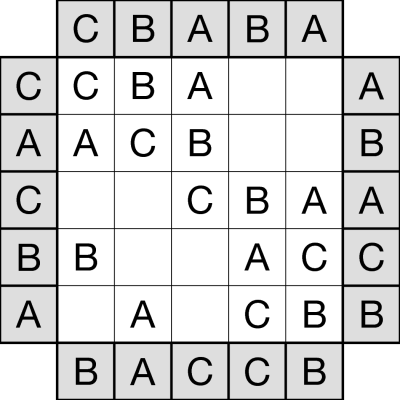 In ABC Puzzles a letter outside the grid reveals the first letter encountered in that row or column, and each letter from the given set (e.g. A, B and C) must be placed exactly once in each row and column. 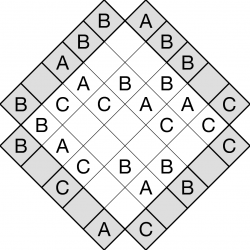 There is always at least one empty square in each row and column. 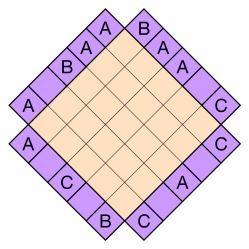 These puzzles can be made at varying sizes and logical difficulties, and the presentation can be varied too as in the rotated version below. In a more complex version the second (or even third) letter encountered in rows and columns can also be indicated with variant clues.